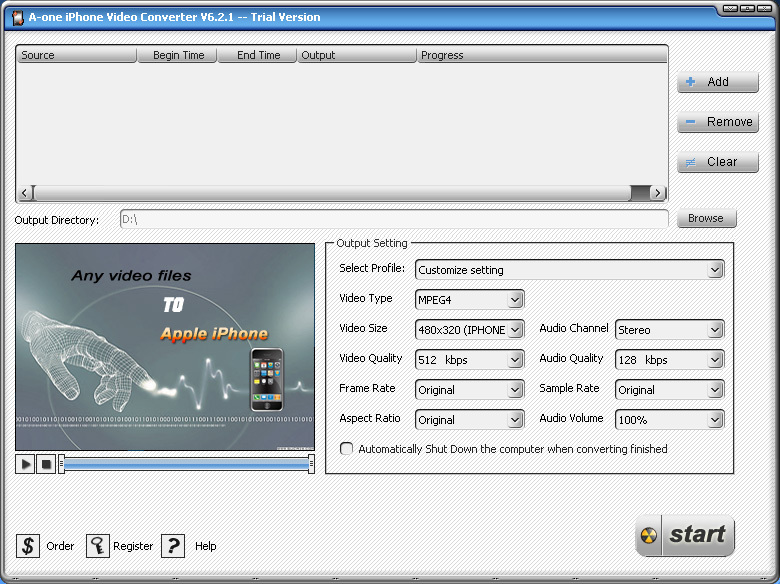 A-one iPhone Video Converter is the most powerful Video to iPhone converter software. It Convert various video file formats to MP4 for iPhone with high speed and fine quality. It automatically converts almost all formats of video files that are already on your computer such as DivX , XviD , AVI , WMV , MPG, MPEG , ASF , MOV , ASX , SVCD , VCD stream formats into iPhone mp4 format. ...... Absolute definite,why not have try? You could convert batch video files with A-one iPhone Video Converter. It is convenient for you to add several video files one time to convert , and then just go to sleep , it could automatically shutdown your computer after all conversion done !! * Convert various video file formats to MP4 for iPhone. * Batch files conversion and conversion speed is 2 times of the playback speed. * Support almost all digital video files (AVI, MPG, MPEG, ASF, WMV, MOV, 3GP, SWF,VOB ,VCD, SVCD, QT, DIVX etc.) into an iPhone-ready format. * User-friendly interface : Set the start position and end position of source file to convert. * Hardware auto-detect: Automatically detect your hardware and decide the best converting speed. Qweas is providing links to A-one iPhone Video Converter 6.9.31 as a courtesy, and makes no representations regarding A-one iPhone Video Converter or any other applications or any information related thereto. Any questions, complaints or claims regarding this application A-one iPhone Video Converter 6.9.31 must be directed to the appropriate software vendor. You may click the publisher link of A-one iPhone Video Converter on the top of this page to get more details about the vendor.